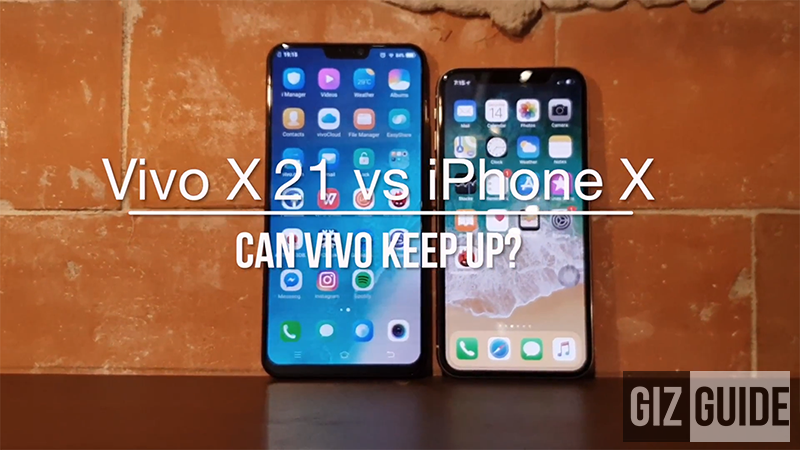 Watch: Vivo X21 vs Apple iPhone X - Can Vivo keep up? 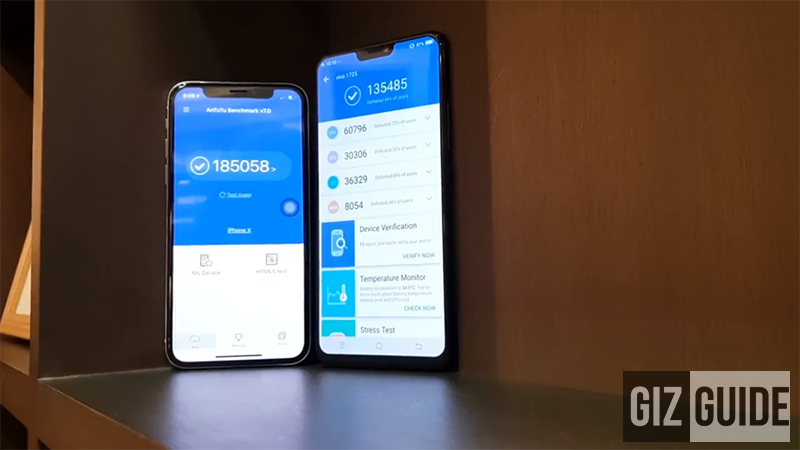 Home / reviews / video / vivo / Watch: Vivo X21 vs Apple iPhone X - Can Vivo keep up? We just finished another features comparison, this time, between the Vivo X21 and the Apple iPhone X. We compared the two to see their strengths as well as their advantages over the other. Both the Vivo X21 and the iPhone X have glass and metal build. The two have mirror-like design that feels and looks premium. The Vivo X21 has Corning Gorilla Glass 3 protection while the iPhone X missed on that point. The iPhone X has a 5.8-inch OLED display while the X21 has a bigger 6.28-inch Super AMOLED Full view display. Both has a notch at the top but the X21 sports a smaller one. Both phones sport minimal bezels which makes it comfortable to hold and navigate. The X21 has a brighter display while the iPhone X has a more accurate color reproduction. In terms of audio quality, the two are keeping up with each other. On our test comparison, we did not hear much of a difference between the two when we played music at the same time. The Vivo X21's one day and a half battery performance on a single charge wins over the iPhone X's 8 hours battery life. Both smartphones can shoot nice and decent photos under daylight and lowlight selfies. However, for indoors and portrait or 'bokeh', the iPhone X did a better job since it took selfies with more natural and accurate colors plus a deeper background blur. The iPhone X performed better with higher benchmark results. Meanwhile, the Vivo X21 boasted of its In-Display fingerprint scanner besides the Face Unlock that was earlier introduced by the iPhone X. In the end, the pricier iPhone X came out with better and faster performance, sharper display, slightly better main cameras, and a more defined and streamlined OS. But, the Vivo X21 is no slouch at almost half the price of the iPhone X. It is definitely a flagship grade phone in terms of design, battery life, performance, and features. The iPhone X is recommended if you are already in the iOS ecosystem while the X21 is a more affordable and great alternative smartphone.